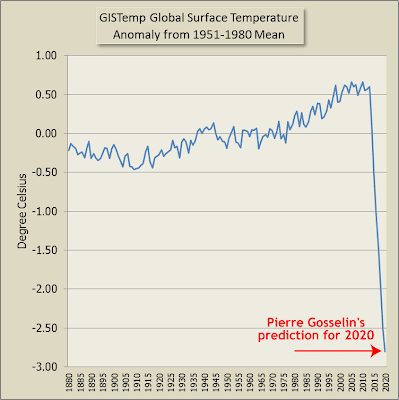 A commenter alerted me to a post by science denier Pierre Gosselin (archived here). He reckons that because there are quite a few climate cranks who run blogs, it disproves the fact that 97% of science papers on the topic find that humans are causing climate change. Or something like that. Which of course it doesn't. - Ocean cycles – PDO, AMO, etc. Having done a quick count of the warmist sites, I came up with 48 from a total of 137. That’s crunches to be only 35%. That’s a far cry from the 97% the warmists like to try to have the rest of the world believe. He thinks that because ScottishSceptic found a whole bunch of crank climate disinformation blogs that somehow PROVES that only 35% of the scientific literature on the subject finds that humans are causing climate change. That means that almost two thirds of all climate science blogs are very skeptical or somewhat skeptical of the IPCC science (skeptic or luke-warmer). That’s hardly a consensus! Many of the skeptic sites are run by scientists and meteorologists…also showing that that “consensus among experts” is a complete myth. Moreover, the top 20 sites are clearly dominated by skeptics. I'd love to know which "skeptic" sites are run by "scientists and meteorologists". Anyone? The list puts websites like Jeff Masters at Wunderground.com and ClimateProgress, which would both beat WUWT readership by a mile, way down in the rankings. That's because ScottishSceptic used wrong and outdated addresses. The list doesn't rank any of the scienceblog blogs because they aren't shown separately in Alexa. It leaves off the really popular blogs such as the BadAstronomy on Slate.com, and the myriad of general and specialist science websites that post articles on all sorts of topics, not just climate science. All of which, like Carl Zimmer on the Loom and Ed Yong at National Geographic would leave Anthony Watts' pitiful effort at WUWT in the dust. And it doesn't include discussion boards like Reddit, which was the subject of my last article. Thing is, fake sceptics have very little choice when it comes to quack websites. They have blogs run by cranks like Anthony Watts and Pierre Gosselin and that's it. Their choice is very limited. Pseudoscience nutters don't have science blogs or specialist climate science blogs. They don't have quality websites like ArsTechnica.com or Smithsonian.com or Scientific American or National Geographic. They don't have science and environment sections in mainstream media, like at the Guardian or the Sydney Morning Herald. And there is no such thing as in-depth discussion of pseudo-science, which is why they are stuck with the sort of quackery you read at WUWT and notrickszone and similar. There are no equivalents in pseudo-science land of climate websites run by scientific organisations, like NASA, the CSIRO, all the universities and meteorological offices around the world. They would get vastly more web traffic than the piddly little anti-science blogs at which science deniers congregate - and from a much better educated and informed class of visitor, too. Of course, one big information source the fake sceptics lack is pseudo-scientific journals. They is no pseudo-science equivalent of Nature, Science, PNAS, the Journal of Climate or any of the dozens of other high quality scientific journals. Fake sceptics and contrarians have a few, like Energy and Environment and the dog astrology journal. But not many fake sceptics bother with getting their pseudo-science published. Why would they when it's so much more fun to attack scientists personally and make silly "ice age cometh" predictions? I expect there are equivalents to the climate disinformation websites in other aspects of science. I'm not up with blogs that specialise in promoting HAARP and chemtrails conspiracy theories, which fall into the same bag as the climate science cranks as far as I'm concerned. There are also the cranks who peddle health pseudo-science. One Mike Adams, who blogs at various places but who I'd not come across before. I have come across people who are fans of another health pseudo-science crank called Joe Mercola. Unlike the climate science disinformers, these blokes seem to be able to earn a good living from their quackery and they attract a lot more traffic than WUWT does. So the climate cranks might pat themselves on the back for getting lots of readers. The rest of the world scratches its collective head and wonders. Why would anyone be pleased to be viewed as a crank, even a popular nutcase? Is it really something to boast about? What motivates someone to have the "most widely read crank pseudo-scientific blog"? Why would anyone be proud of being anti-science? 1. Be a crank yourself. The most popular pseudo-science blogs are run by cranks. Be a caricature of a human being. Make believe you are a hero for fighting all those nasty scientists and the guvmint, or even portray yourself as a god (worshipped by Janice Moore). 2. Be a conspiracy theorist. If you allege that all climate science is a hoax you'll draw a lot of other conspiracy theoriest out of the woodwork. Add in conspiracy theories about money and government, like JoNova does, and you'll draw a bigger crowd. 3. Publish outlandish articles. The more outlandish the better. Catching UHI disease from Russian steampipes isn't bad. OMG it's insects isn't bad. An Ice-Age Cometh is better still. 4. Make fun of well-respected scientists. Libel them ferociously. Support your mockery with cartoons. Your readers might not understand science (or pseudo-science) but they just love being part of a lynch mob. They take special delight in "shooting the messenger". 5. Keep text to a minimum. Short sentences and short paragraphs are best. Words of no more than two syllables and not too many of them. Your audience finds text tedious but can (sometimes) follow pictures, especially coloured pictures in cartoon-style. 6. Blow the dog-whistle loudly. Make sure even the dimmest person in your audience understands that you are mocking science. Otherwise they will leave you for another crank blog. 7. Reward readers who flame sensible comments. Make sure your readers pile on so heavily that normal people will disappear never to return. Otherwise you'll lose most of your ratbag audience and your blog will fail dismally. 8. Regularly post silly drawings that look "sciency" - the uglier the better, supported by "equations" that look sciency to the uninformed. That way you can proudly claim to be a 100% genuine pseudo-science blog. 9. Make up lies about what scientists actually have found so that you can say "it's wrong" and "aren't we clever for showing all the science is wrong". 10. Wear your politics on your sleeve. 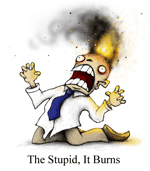 You really don't want any bleeding heart liberals polluting your blog with comments. Finally. Flatter your audience. Make them feel they are clever for rejecting science. Tell them how smart they are for not accepting anything from the evil guvmint or gravy-train scientists. Everyone loves a bit of flattery. The numbers highly biased, but difference in fraction of "sceptics" between the scientific literature and blogs may be right. Which is interesting in itself. (Let is first be clear that most "sceptics" are not scientists.) Those scientists that are "sceptic" do seems to have a high probability of being a blogger. Much higher as the probability that a mainstream scientists is a blogger. One almost wonders what comes first. I notice with my own blog, that thoughtful scientific posts are read only by a small group. The posts about the climate "debate" are much more popular, by orders of magnitude. An even easier way to get readers as scientists is probably to write anti-science posts. Thus someone who loves the attention may have a tendency to become "sceptical" blogger. For some even negative attention is better than no attention and the "sceptics" will praise you for your "courage". Something else. One reason the list is not reliable is that WUWT has introduced a Alexa spybar. That produced an enormous spike the in "traffic" of WUWT as measured by Alexa. That is the way Alexa rewards bloggers and wegmasters for using their spybar, which they use to estimate the traffic. Because many "sceptics" use this spybar it seems likely that also other "sceptical" blogs have seen an artificial increase in traffic. Why would anyone be proud of being anti-science? Al-Qaeda surely is proud of it and try to prevent people getting an education. Hypocritically they do use the gadgets that could be developed due to science. The point is that all that the fake sceptics have is blogs, which is why they proliferate even though they are so dumb. There is very little else for science rejectors to read. Oh, there's the pseudo-science twaddle like the "Not the IPCC report" - but who on earth reads that rubbish? I doubt too many fake sceptics have managed to wade through all that tripe. And other than that and denier blogs, there is nothing, zilch, nada for the fake sceptic to enjoy. Whereas there is a wealth of material for anyone who is interested in science. Blogs are only a tiny section of what a science enthusiast would read. There are journals and magazines and newspaper articles and research institution websites and a whole host of fabulous scientific sources out there. Pseudo-sceptics avoid all that like the plague. WUWT is tabloid journalism. Same reason tabloids are popular. They aren't news, they are entertainment masquerading as news. Do you mean "are read", or do you mean "are commented on"? I do sometimes get the feeling that the more right a posting is, the fewer comments it gets, because if you get it totally right there's nothing to say. I have the same impression. Although in my case it might not be "getting it right", but rather formulating (too) carefully, the way academics are trained to write, which makes our texts so hard to read. Without claims that go beyond the evidence, there are not much comments. Except for that one, there is no relationship between number of readers and comments. I just looked, I would not even be surprised if the relationship has a negative correlation. The second most read post on a misquotation about the humidity trend has only 8 comments. The misquotation is clear and hard to dispute. The specialty posts are commented on relatively much because the readers are really interested. I think point #2 on that list is particularly important. Blogs that pander to conspiracy theories tend to get very popular with a lot of obsessive cranks with time on their hands who take the subject on hand much like a hobby. I joined a chemtrail group on facebook recently out of curiosity and was amazed at how active it was. So many people excitedly posting articles and photos of clouds and long crank comments about how the government/UN are out to get us. Complete dissonance. None of them agreed with each other on specifics like what the chemicals were and were for. You could literally get away with posting any old nonsense and it would have people "liking" it. Very easy for someone with time to produce a blog on such a subject and it become very popular. A blog on the science of contrails in contrast would be completely devoid of readers. I had also thought, this would be a hobby. However, if you look at the counter of WUWT you will see that most people read WUWT on Monday and they do not waste their precious free time in the weekend on this nonsense. For a hobby blog, I had expected the weekly cycle to be reserves, most readers on the weekend. Can you see any weekly cycle on the chemtrail group? I am wondering whether this is normal. That chemtrail groups exist is really weird. I came across all sorts of different cranks when I was on HotCopper (a share trading forum). I'd never heard of stuff like chemtrails and HAARP and the new world order until I joined that forum. There is a lot of overlap with climate crankery. I don't know how people like that cope in society. I think the internet has helped them survive. Because they are few and far between, the internet has connected cranks from all over the world, making them feel not so alone and giving them the illusion that there are more nutcases in the world than there really are. Many climate cranks would think there are a lot of climate science deniers in the world when in reality they are a small minority of the population. Blogs feed their illusion, which is why they make such a fuss about page hits. I maintain that each article at realclimate.org and skepticalscience.com are read by a lot more people than any single article at the "most read science denying blog". WUWT gets a lot of readers because Anthony posts so many articles each day. But I bet no single WUWT article would be read by as many people as each realclimate article for example. Occasionally (just for the fun of it) I wade into Youtube 'discussions' on UFO's to remind UFO sighting video submitters and their unconditional fans that the word 'unknown' in 'Unknown Flying Object' is very relative and depends usually on the level of (scientific) education received by the submitter as well as his/her level of natural skepticism. cruising at 30,000ft) is claimed to be a UFO. Here's a few examples: http://youtu.be/sfgj3Mo_5jQ or this 'excellent' Murdoch owned Skynews report on a meteor over Cuzco http://youtu.be/BB3M2m-ZiCI / http://www.dailymail.co.uk/sciencetech/article-2030428/Meteorite-Peru-leaves-forest-fires-wake-Cusco.html#ixzz1W8P6vZNR . Or pick any 'chemtrail' video on Youtube. You get the idea. The similarities with climate denial are multiple: for instance, UFO believers are unconditional in their belief and no amount of (scientific) evidence can persuade them. A famous Michael Schermer experiment comes to mind in which he showed passers-by a picture of something he claimed to be a UFO but which was in fact a fake UFO made and photographed by his own kids; even after he showed the public the actual fake UFO which his kids had made, some still rejected the explanation and maintained their belief that the photograph showed a UFO. Watch this video here: http://youtu.be/o7Tu-28hyow . In the aforementioned Michael Schermer video, another similarity with climate denial is the role of the outside expert who in this case validates the UFO claim as he cannot find any evidence that the photo is fake. Of course, this person's limited photographic expertise forms the basis for many UFO believers to further reject any alternative explanation for the observed phenomenon. In climate denial, Anthony Watts, Marc Morano, Andrew Monford and Pierre Gosselin (to name just a few) are the UFO photographic expert equivalencies and their judgements and opinions on a wide range of climate related scientific disciplines are instantly believed by their unconditional, non-skeptic followers. To put it bluntly; the fact that 'skeptic' climate sites score higher on Alexa's Site Popularity Ranking says more about the levels of stupidity and general ignorance of all those 'skeptic' sites' unconditional followers than it says about those sites actually offering valid information. It is sites like Hotwhopper and others which show us every single day that no matter how stupid, dishonest, unscientific and deceiving 'skeptic' climate sites are, their followers are more than willing to believe whatever they claim as long as it is in accordance with the opinion they already have and are totally unwilling to change. The problem is that if, as an experiment, you ask someone who knows little or nothing about climate change to search out information about it on the www, the odds are that the first 5 websites they come across will be peddling climate misinformation (try it! ): and it'll be all dressed up in a 'sciency' nature with graphs of the cherry-picked kind. To wade through the dross and discover the real scientific facts, the searcher needs to have a basic understanding of science and an intelligent, enquiring and sceptical (how ironic!) mind. Because denial is a very natural and innate quality in all of us, the denial sites are telling the 'man in the street' what they want to hear, and it's difficult to break through that barrier. Let's face it, most of the arguing we do in comments on blogs is pointless as far as the participants are concerned. It's more important from the rational climate perspective just to make the point to casual readers that the fake sceptic commenters are in error and there is an alternative, science and evidence-based viewpoint. And at that point I usually link to http://climate.nasa.gov/evidence. At least then there's a chance that the casual reader will hit on somewhere that will give them the facts. In that situation I never link to Skeptical Science because I know, either the site's moderator will delete the comment, or the next commenter on the thread will write that SkS is "warmist propaganda" or some such. If the casual reader sees that partisan comment in relation to a NASA link, at least there's the chance they'll recognise that they've entered a den of conspiracy nuts. Very important in this regard is that bloggers and webmasters stop linking to WUWT and Co without a NoFollow tag. Otherwise such links are interpreted by Google and Co as recommendations and the linked pages are listed higher in the search ranking. Going through your old posts and adding NoFollow tags is less fun, but more productive as 10 debunking posts. For details on how to do that see my NoFollow post. I'm wondering why you said... "according to Pierre Gosselin, the temperature will drop to 2.5 degrees Celsius below that at the beginning of the 20th century". There's nothing in Pierre's comment saying that his prediction was in relation to the beginning of the 20th Century, nor is there any reference to that start date in the post author's question. The question was... "What is your global average temperature prediction for the next several decades?" How did you determine that his prediction was based on the temperature at the beginning of the 20th Century? That's normally what the 2 degrees, 4 degrees or whatever rise we will see is taken from. Doesn't really matter though does it. 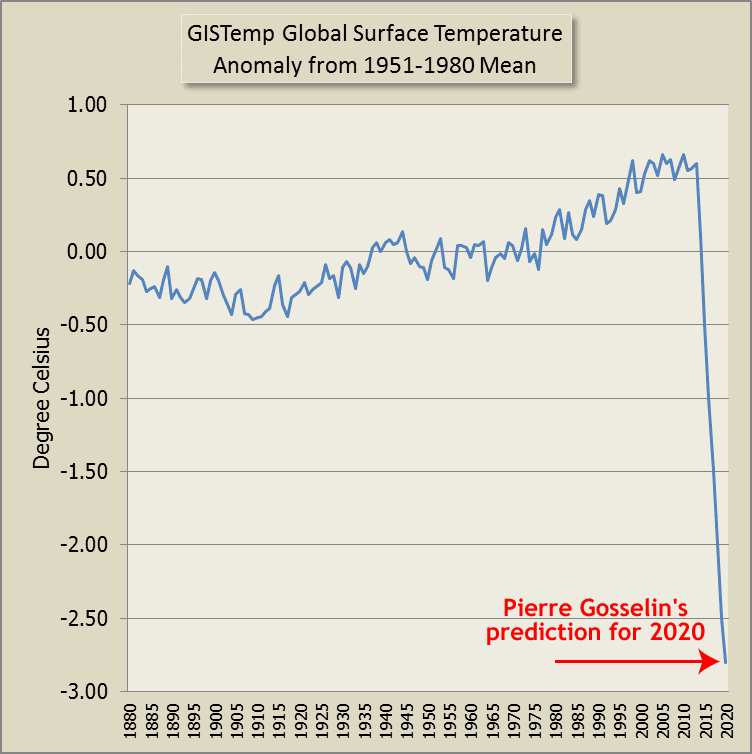 Whatever Pierre had in mind as his start of "minus 2.5 degrees" it's one of the silliest predictions a person could make. PG wrote: "-2.5°C by 2020!" Of course, if he means relative to the 1951-1980 mean, it's only slightly less silly. For a while I amused myself by calling out Pierre . But the sheer volume of pseudoscience Pierre cranks out was more than I could keep up with. He is particularly fond of the global cooling meme, which contradicts another of his favourites that global warming is caused by the sun. Notrickszone also has a habit of mistranslating original German texts to English. Now this would be a minor issue if it weren't for the fact that all mistranslations I've spotted so far were in favor of Pierre's argument plus the fact that Pierre runs (along with his wife) a German/English/German language translation service. In analyzing the SalbyStorm blogs/comment, indeed a category emerged that might be called: "academe was bad to me, as proved by MQ being Salby" and/or "I have great theories but the gatekeepers refuse to listen." This was somewhat akin to B. Maccabee's UFO lament in part 19.2 of my favored dog astrology journal. He claims ice cores wrong, Antarctic ice is only 6,000 years old. Clearly, he has a kindred spirit in Salby, who also knows the ice-cores are wrong. 2)Albeit not Australian Harry Dale Huffman (harrydhuffman), posted at 3 of the Salby threads, WUWT, Tallbloke's, and Bishop Hill. The System Is Broken: Incompetent Science and Insane Politics. There was some old catastrophic theory, may with von Daniken, Ah I have it Velikovsky that talked about plantary collisions and the current setup of the solar system being recent. So maybe this guy 'borrowed' from Velikovsky? What's interesting is how you almost never hear of Velikovsky anymore. And I can't help wonder how many climate change deniers migrated from Velikovsky and van Daniken cults to their current 'orbits'. None of this surprising or even new: I've been reading Skeptical Inquirer for decades, Martin Gardner's books, Randi's, etc. Now and then, when in need of amusement, I pick a random article from my faovrite dog astrology journal to see what new delights can be found. There is a whole set of people who are angry that their ideas are not given the recognition they think deserved, so they seek venues where they can be welcomed, no matter how pseudo-science they are. Of course, the WWW has opened up massive possibilities. This is why I distinguish between pseudo-science (where somebody really believes and wants scientists to recognize them) and anti-science, where the goal is to cast doubt and confusion. The latter is happy to employ the former, even when as a group, they contradict each other. Confusing the UK government funded NERC program with an NGO. Failing to recognise that the final two authors are established climate scientists who have won numerous awards. I could go on ... but that will do for starters. Anthony confused the NERC with the NRDC Action Fund. Now he claims that the NERC is just a research council with a political mission to grab a headline. "a political mission to grab a headline." Huh? does that even make sense? Thanks, anonymice - I've just finished writing about Anthony's article about the solar paper. Luckily I had the foresight to archive the original in all its woeful "glory".